Once upon a time (AKA. before I had kids) I worked in a crisis pregnancy center as a receptionist and a lay counselor. From as far back as I can remember, I’ve had a heart for the hurting, especially for women and babies, so this job was a perfect fit for me. That little clinic was such a wonderful place to work. It ran (and still does to this day) on God’s grace and the love of all the employees and volunteers who dedicate their time to being the hands and feet of Jesus. We prayed to be a blessing to the clients who walked in, and most of all, to make a lasting impression on them. I often witnessed God at work in that clinic, but one particular incident stands out in my mind all these years later. There was a client, a young woman, who came in looking as if the weight of the world was on her shoulders. Her shoulders literally drooped, and her countenance was sad and withdrawn. She came in to confirm her pregnancy—the test was positive—and to discuss her options. Our counselor, a sweet older lady, talked with her, answered her questions, and prayed with her. I didn’t know the specifics of the client’s situation, but I imagined it wasn’t good. Once she left the clinic, all we could do was pray and wait for God to change her heart. The following week when I welcomed a woman into the clinic, I thought she looked familiar. It took me a minute before I realized it was the same client, except that she looked nothing like the woman from the previous week. This woman had walked in with her head held high, a purpose in her steps, and a genuine smile on her face. I asked one of the nurses if this was indeed the same client, and she confirmed it was. With the support of her counselor, the woman had decided to keep her baby and was coming in for her first prenatal appointment. Wow, what a transformation! It was truly a privilege to witness God change her heart and save a life. I love reading stories where characters have “heart changes” because these are the kinds of characters we can relate to and root for. As an author, I want to write stories about growth, which means I have to put my characters in difficult situations because (unfortunately) those times push us to grow. This is what I did in my latest release, Love’s Choice, a novella set in the First Street Church Kindle World. Please click on the image for the buy link. Missy Clark left small-town life and her first love when she went away to college. Five years later, she returns to Sweet Grove with a secret that’s sure to tarnish her reputation. This book was inspired in part by my experiences working at the crisis pregnancy clinic. I put poor Missy through the ringer in this story, but I also provided a childhood friend, Nate, to support her. They both experience heart changes as they grow closer to one another and to the Lord. I just love their sweet relationship. With those words, she slipped out of the truck and hurried quickly into the house. As the front door closed, Nate had the sinking feeling he just lost his best friend. What difficult circumstance have you grown from? How did God change your heart through it? Please comment below and let me know. I look forward to reading your answers. 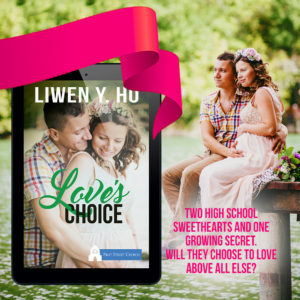 Giveaway: I’d like to give away one digital copy of Love’s Choice. One winner will be randomly chosen from the comments below. The giveaway will remain open until midnight on Sunday, December 10th. Hi Liwen, I am enjoying reading your stories. Thanks for sharing your story, I imagine working in a crisis pregnancy centre would be an emotionally tough experience. Going through my parents divorce, mum’s remarriage and moving our family to a new city to live taught me the value of looking at the bigger picture and relying on God. Thank you so much, Wemble! I love your perspective on what you learned from all the changes you went through. Thank you for sharing. This is such a sweet testimony! Thank you for sharing it, and letting God use you to help make a difference in someone’s life. In high school I struggled with self worth and depression. Through consistently reading His Word, prayer, and the help of others, I was finally able to refocus my thoughts on WHOSE I was and who I am in Him. It wasn’t a quick change, but is something that I still have to continually choose to keep my focus on His Word and on Him. I know I am better for struggling through it, and I have been able to turn and help others who are struggling also. That is such a wonderful testimony! Thank you for sharing. It’s amazing how God can take the hard things in our lives and use them for good. This is an inspirational story! Thank you so much for sharing it, Liwen, and congratulations on your new release! Something that made me grow was moving to Hong Kong and learning Cantonese! Oh wow, I know you lived in HK, but I didn’t know you learned the language, too! That’s amazing, Margaret. My hubby is Cantonese and it took me a decade to understand most of what his family says (I haven’t been brave enough to speak it though). What a wonderful sharing, of saving 1 life. I worked with our local Pro-life group witch had a birthline with it. It gave support to those who chose life. We had a 24/7 phone line that helped with that. We even got a few who chose adoption and helped them find christian organizations that would help with that. But the lord lead me to address the question about what happens after an abortion, mentally. I am a mother of two who lost three babies between them. There is a cycle of grief after each one. What women are not told, after you decide and abort that baby, you go through a similar grief cycle but this one includes their decision to end a life. I ended up writing an article about dealing with grief and those loses.Thanks again for sharing that story. In my case, the lord used my losses to help others, that ended up helping me. Oh wow, what wonderful work you did with your group, Nancy! Thanks for sharing your experiences. Yes, we had a post-abortion support group at the clinic to address the grief you talk about. I’m sorry to hear about your losses. That is so hard. I have lost one myself. God bless you. This sounds like a wonderful story. Thanks for your post and the giveaway. What a great story you shared. You must have experienced both ups and downs working there. Your new release sounds like a winner to me! Definitely many ups! :) Thank you for stopping by, Sherri! I love stories like this! I can’t wait to read it. The story sounds interesting. Thanks for writing! It was my pleasure! Thanks for reading, Narelle.